These New 18 Ounce Styrene Plastic Tropical Coconut Cups feature your design and message on one side of the cups. 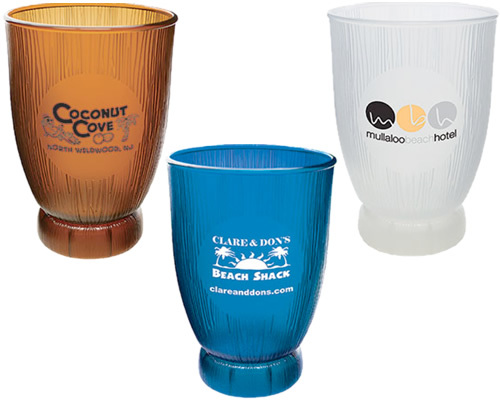 Blue, Brown, and Frosted Tropical Coconut Cups are available with your choice of a one- to full color (4CP) print. 18 Oz. Tropical Coconut Cups measure 3.5" across and 5.5" tall. Unique and festive, our Tropical Coconut Cups are perfect for serving tropical drinks – Mai Tais, Pina Coladas, Tropical Coolers, or any other drink you have in mind! The minimum order is just 48 Custom Coconut Cups. Your satisfaction is guaranteed when you order Customized Plastic Glassware from us. Getting started with your Custom-Imprinted Tropical Coconut Cups is easy! Simply call 1-800-233-0828 and then e-mail us your camera-ready artwork. Turn-around time is about 3 weeks after proof approval. Rush production and delivery is available for an additional charge. Feel free to browse our other Custom-Imprinted Plastic Glassware including our Martini, Margarita, Wine, & Champagne Glassware and our Ice Buckets.